We are kick-starting this series with the narratives of the three TimeForAll founders: Kathy Perlow, Abby Greer, and Stacey Jacobsohn. Here is Abby’s narrative. After losing his own father to cancer, an 8 year old boy learned how to grill cheeseburgers from a timebank dad. A woman with a new medical diet frantically posted on her timebank’s Facebook page and within minutes found someone to deliver a fish not available in her local grocery store — a full-sized carp — along with a biology professor to correctly dissect it. 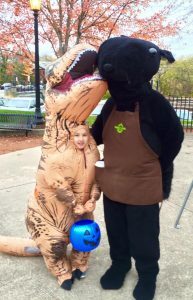 A timebank member who loves costumes regularly dresses up as the Kent black squirrel mascot for time credits bringing a smile to everyone’s face. Abby Greer first heard about timebanking through reading Edgar Cahn’s book, Time Dollars, and it wouldn’t let her go until she founded her own timebank with the help of a community leader in 2010. 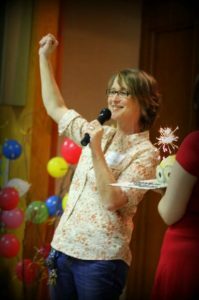 Abby Greer lives these stories everyday as a Timebank coordinator and founder for the Kent Community TimeBank in Kent, Ohio. The Kent Community TimeBank eventually became one of five timebank hubs of the larger Crooked River Alliance of Timebanks with a total of 710 members. Abby is also one of the founders of TimeForAll — a timebank dedicated to timebank coordinators helping coordinators. How do you trust someone you never met, who doesn’t have a professional degree into your house to walk your dogs or deliver a fridge? 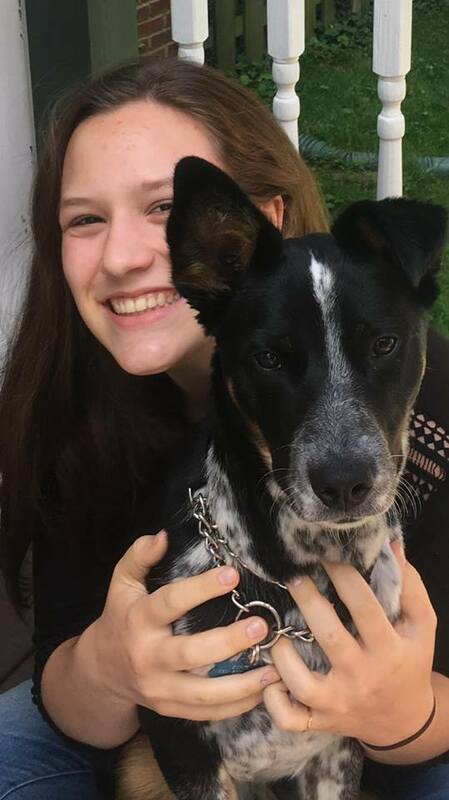 For Abby the solution is through fostering and nurturing the sense of community through social events such as potlucks, through interactive games and conversations. And with a community in place, the possibilities are endless. 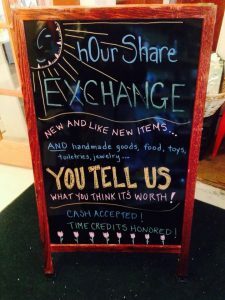 Time dollars do not always work like money — you can’t buy an airplane ticket with them, can’t pay your taxes with them — but at least for a year in Kent, Ohio you could purchase items with your own time credits. At the hOur Share Exchange there was no cash register, no prices. Items were donated by the community. Founded by Amanda Edwards, a timebank member, she and Abby believe it was the first of its kind. “If there was a crock pot on the shelf and a timebanker wanted it, the staffers would say ‘How much time are you willing to give to the community to have that crock pot?’ And that is what it cost the timebanker. 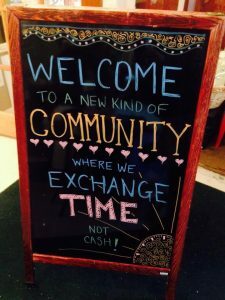 Timebanking, however, is more than just building a community or creating a timebank store. Whether we realize it or not, money is a lifestyle. One of Abby’s main challenges of being a timebank coordinator is getting people to realize that timebanking is a lifestyle change — that we each have to rewire our brains to think in terms of timebanking. When her daughter needed a refrigerator, Abby’s own first impulse was to go to the store, but then it hit her: TIMEBANKING! And five minutes later she had a fridge for her daughter in return for a time credit donation. It is the stories and experiences that Abby has gathered over her seven year journey as a timebank coordinator that add to living the timebank lifestyle. 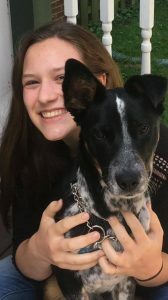 Whether it is giving time credits for walking a dog, having conversations with coordinators around the world or community members in her own hometown, or finding a refrigerator, Abby is building her community.